Good morning! Don’t let my serene setting fool you. I’ve been running around like a nut for the past couple of days and it’s only Tuesday! Wearing this light and airy look made the running around part a lot easier not to mention more comfortable thanks my Stan Smith sneakers. We’re heading into the heart of summer (can you believe it?!) when easy, breezy style is the rule rather than the exception. I love a relaxed, casual look that’s still pretty, too, and my Elizabeth and James top and Banana Republic striped, wide-leg trousers fit the bill perfectly. Your pants are so much fun! So sporty yet so elegant! Wonderful! I am loving those easy breezy pants! Your blouse tops them off perfectly! I almost bought those pants!!! You styled them absolutely perfectly! Fantastic look! Hah…I just saw those pants at the store last weekend—thought about it, but didn’t get them! You wear them so well! Oh Mary, you’re so precious!! I love how light and fun this is!!! Great pants, beautiful blouse, cute kicks and GORGEOUS you!! Mary I need to tell you that your website is beautiful and I love all the new things that you have added. How do you find the time to do it all? Love, love, love your flowy top and paired with your sneakers and striped comfy pants its a great summer feel and look. Thank you so much, Cherie, for your kind words. Trust me, some days I don’t know how I do it either, but to know that what I do is appreciated by people like you makes it all worth the effort. Thanks again! 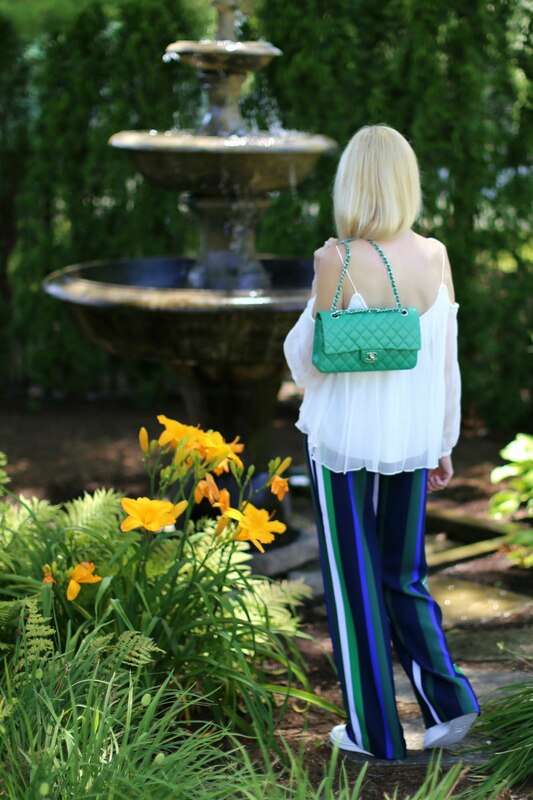 Such a fun pants that somehow still look so elegant! Love the top! 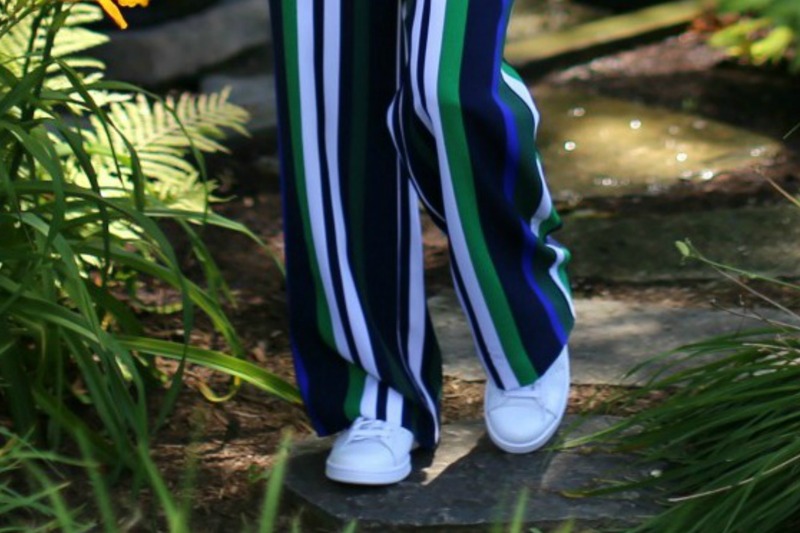 Those striped pants are so fun! Love this sporty look on you! Adorable! I am totally crushing on these pants! The colors are fabulous and I love the large scale stripes. These are definitely right up my alley! Do come link it up with me On the Edge of the Week! 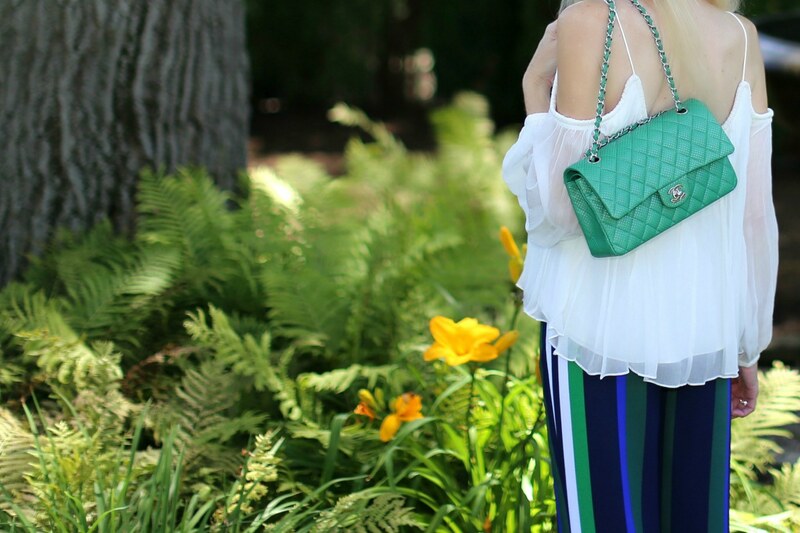 What a fun casual outfit, I am in love with your purse!